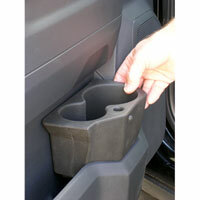 Does your '10-'18 Ram truck have this spiffy foam rubber drink holder insert in the truck's passenger side door pocket? If it doesn't, get this one by MOPAR. This work great and my passenger doesn't have to use both cup holders in the console. Perfect fit. Great for passengers drink.